Modifier - Allows changes to be made to the user interface (UI). Examples include adding new fields, moving fields around, and changing field labels, etc. Customizations made to GP using Modifier will be compatible with both the GP 2013 desktop version as well as the Web Client. Dexterity -This is the programming language in which Dynamics GP is written and customizations to the code level require a Dexterity developer. Example of changes to Dexterity code include things like adding new business logic or capturing business domain specific data through alternate forms or window modifications. The possibilities are endless. Customizations made to GP using Dexterity will be compatible with both the GP 2013 desktop version as well as the Web Client. VBA - Is most often used to add additional functionality to fields such as disabling a field or automatically populate fields from a database, etc. 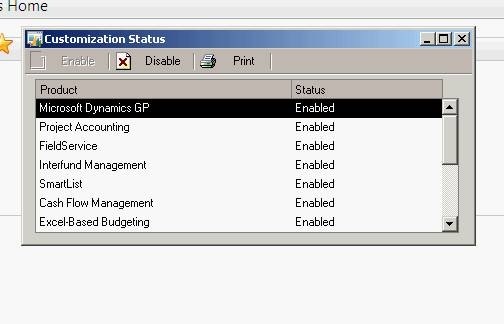 Although customizations made to GP using VBA will be compatible with the desktop version of GP 2013, at this time they are not compatible with the GP 2013 Web Client. VST - Allows the same type of changes that would be made with Dexterity but with the .NET programming language. Although customizations made to GP using VST will be compatible with the desktop version of GP 2013, at this time they are not compatible with the GP 2013 Web Client without additional modifications. All customizations are stored in the AddIn subfolder of the Microsoft Dynamics\GP folder. There are a few simple ways to tell what type of customizations you have in Dynamics GP. 1. Modifier - The Customization Maintenance window will list modified forms, modified reports, and custom VBA code and references that are active on the workstation. If you have made customizations to GP using Modifier, there will be a dot in front of the window’s page title. 2. Dexterity - The Customization Status window will list Dexterity customizations, as well as the Dynamics GP modules and Dexterity-based ISV solutions that are installed and active. 3. 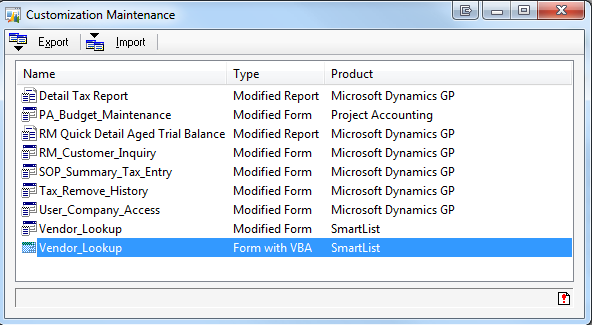 VBA - The Customization Maintenance window will list modified forms, modified reports, and custom VBA code and references that are active on the workstation. If you have made customizations to GP using VBA, there will be a dot at the end of the window’s page title. 4. VST - All customizations made to GP using VST are stored in a folder called AddIns. If you have VST customizations, you will find them inside this folder located AddIn subfolder of the Dynamics GP client installation. This is typically C:\Program Files (x86)\Microsoft Dynamics\GP\AddIns. If GP customizations exist that may not be compatible with the new GP 2013 Web Client here are a few suggestions to preserve your customization’s functionality. Is this functionality still needed‌? Can it be improved‌? Determine if the customization is still needed. New releases are packed with new functionality and the task that the old customization helped accomplish may now be handled out-of-the-box in the new version. Or, your business may have changed and it is simply not needed any longer! A business process analysis against the new version will help identify which customizations are no longer needed. After reviewing the new release’s capabilities, you may find that there are many other new features offered that you hadn’t even thought of before. It’s like trading in your old 1994 Honda Accord for the 2013 model—you were excited about the built in navigation system (no more Garmin attached to your windshield) and heated seats but you had no idea that it had blind spot detectors and could park itself! So when you’re ready to make the switch, make a point to learn about all the new features of the software, not just the ones you already know about and you may be pleasantly surprised. Sometimes you don’t know what you don’t know! If a customization is going to be re-implemented it makes sense to spend a little extra time on the design of the customization. Ask yourself if there are any features that have been lacking that need to be added or can the functionality be changed to make it more user friendly. By making sure you have got the most value out of your customization it will pay off in the long run when you don’t have to continuously make changes to it again and again in the future. As with all customizations, it is a best practice to document, document, and document. Before sitting down with a developer take screen shots of the areas you want to change and document the business process flow. This will provide clear communication between you and your developer and help to ensure there aren’t any discrepancies between what you are trying to achieve and what the system ends up doing. It’s great to keep them on record as well! Now that you are ready to move forward with your customizations into GP 2013’s Web Client, you’ll need to hire a Dexterity developer. Dexterity developers aren’t as easy to come by as other programming languages, but the good news is that if you've found one, they probably know their stuff (this isn't something your neighbor’s nephew in high school can do for you on the weekends). It’s a sophisticated programming language that takes years of experience to learn. After having completed all of the leg work; conducting your business process analysis and providing your developer with use case documentation, the dexterity changes should be a breeze! · Is the programmer certified in Dexterity or Microsoft Dynamics GP‌? · How many or how long has the programmer been working with Dexterity‌? · Will the programmer provide documentation of their changes‌? · Will the programmer, or company they work for be able to support you in the years to come‌?